Huge Capacity 20000mAh - Add 8 solid charges to an iPhone 8, or about 4.5 charges to a iPhone X, or 4 charges to a Samsung Galaxy S8. Smart USB Chargint Tech - Auto detects your device to deliver its fastest possible charge speed with 3.4A(max) output, we strongly suggest you to use a 2amp adapter to charge the Pilot X7 as the 5V/2A input. Upgraded Size and Performance - Built-in Li-polymer battery cell, thus the new version Pilot X7 is much more lightweight and safe than previous version ones, supports more than 500 charge cycles as well. Safety Guarantee - Built-in safeguards protect your devices against excessive current, overheating, overcharging and more. Ultra-long Product Warranty - POWERADD Offers 30-Day money back within 24-Month limited product warranty, technical and friendly customer support are available lifetime. Poweradd, established in 2010, as a leading electronic manufacturer, is dedicated to the most up-to-date electronic products and 3C accessories. 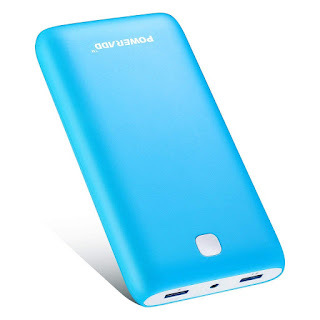 We create accessibility, convenience and reputation by supplying the most user-friendly high-tech power banks, solar panels, power strips, adapters and a wide variety of mobile phone related cables, cases, headphones, speakers etc. Automatically identify the corresponding output current of your devices, charge your devices at their fully intended speed. And charge two devices simultaneously with 2.1A max. Charge two devices at the same time while on the go, the quick 2.1A charge provide the fastest charging speed to you. Here at Poweradd, we offers 24-Month limited after-sell service, buy with confidence. Professional technical support, Efficient and always satisfied after-sell service all the year round.